Brazilian rescuers soldiered on in the search for hundreds of people missing after a breached mining dam triggered a deadly mudslide, but hopes of finding survivors dimmed more than two days after the disaster. Search efforts were paralysed for much of the day on fears another dam could give way in the Vale SA iron ore mining complex in the state of Minas Gerais. 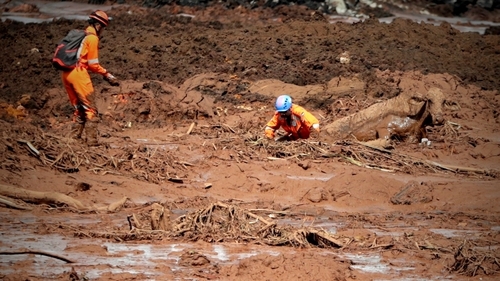 The collapsed dam at Vale's Corrego do Feijao mine buried mining facilities and nearby homes in the town of Brumadinho and killed at least three dozen people. Firefighters spent this morning evacuating thousands from their homes before resuming search-and-rescue efforts in the afternoon once civil defence authorities ruled out the risk of another dam burst and called off the evacuation. "Until the last body is found, the fire department is acting on the possibility there could be people alive," state fire department spokesman Pedro Aihara told reporters. "Obviously, given the nature of the accident, as time passes this chance will go down." Nearly 300 people were still missing, with the list of those unaccounted for being constantly updated, Flavio Godinho, a spokesman for the Minas Gerais civil defence agency, told reporters. Most of the missing are presumed dead, officials said. The figure could rise as authorities reconcile its list of missing residents with the tally of Vale employees who are not accounted for, he said. The confirmed death toll rose to 37 by this morning, according to the fire department. The cause of the dam burst remained unclear. Recent inspections did not indicate any problems, according to the German firm that conducted the inspection. Avimar de Melo Barcelos, the mayor of Brumadinho, blasted Vale for being "careless and incompetent," and blamed the mining company for the tragedy and the state of Minas Gerais for poor oversight. Vale Chief Executive Officer Fabio Schvartsman said in a television interview today that the disaster had happened, even after the company followed experts' safety recommendations. "I'm not a mining technician. I followed the technicians' advice and you see what happened. It didn't work," Mr Schvartsman said. "We are 100% within all the standards, and that didn't do it." The CEO promised "to go above and beyond any national or international standards ... We will create a cushion of safety far superior to what we have today to guarantee this never happens again."